Halland and Smaland were the first Swedish destroyers to be designed after the experiences from the second world war scenes. The two ships were very well suited for submarine chasing and for leading naval operations in also bad weather. Halland and Smaland were among the earliest western ships planned for automatic guns and robots, even if the latter were not yet developed when the destroyers entered service. The wholly automatic 120mm Bofors guns were of a new type capable of shooting 40 shots per minute. Also the 57mm antiaircraft guns were of a new construction as were the long range anti submarine rockets. Originally a single ramp for the Swedish robot 315 was mounted on the aft torpedo tubes. A new robot system with two ramps was installed in 1966. Shortly after the destroyers were delivered, the light rocket station on aft deck was replaced by a helicopter platform. The two destroyers were continuously modernised but mayor changes with new radars and new command and control systems were carried through, on Halland in 1962 and 1969, on Smaland in 1964 and 1967. Halland was in operative use until 1982, discarded in 1987 and sold to Spain for scrapping in 1988. Smaland was discarded in 1984 but three years later handed over to the Goteborgs Maritima Centrum to be preserved as a museums ship. After the war there was a wish in the Swedish navy to get a boat faster and smaller than the destroyers, but more seaworthy than the motor torpedo boats. A hull was designed by the famous yacht architect Tore Herlin and the T 101 (later named Perseus) was built by Gotaverketi in 1950 as an experiment. After a year of intense trials the navy was ready to order a whole series of boats of the new type. As the Swedish shipyards at that time were very busy, the order was given to the Lurssen yard by Bremen in Germany. The Lurssen yard was well suited for the task with all their experiences from the developing and building of the German S-Boote. Eleven boats were ordered. The first one, T 102 Plejad, was delivered in 1954 and the last one, T 112 Astrea, was delivered in 1957. Not many changes were made on the boats more than that the machine directed guns soon got protecting weather domes. 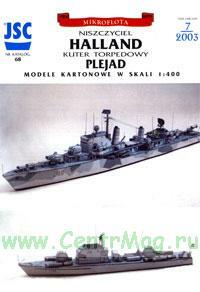 The Plejad boats operated in groups together with the cruisers and destroyers. In the late 60-ies they were replaced by the Spica-class boats which were designed to operate more independently. After discarding, many of the Plejad boats were sold to private people and rebuilt to serve as yachts or charter ships. One of them, T 103 Polaris, was even rigged as a schooner with three masts for charter sailing in the Mediterranian and the Atlantic.